David Ryan Harris has lived quite a career. The 49-year-old singer-guitarist initially started out in 1987, fronting the alternative metal outfit Follow for Now. The Atlanta group built up a huge local following, touring with Fishbone, Faith No More and Pearl Jam, and released their debut album in 1991 with now legendary rock producer Brendan O’Brien. But the band broke up before they could cross into the mainstream or record a follow-up. O’Brien helped Harris get a deal with Columbia Records and together they put out his first solo album in 1997. However, the label dropped Harris shortly thereafter, deeming the music too eclectic and hard to market. 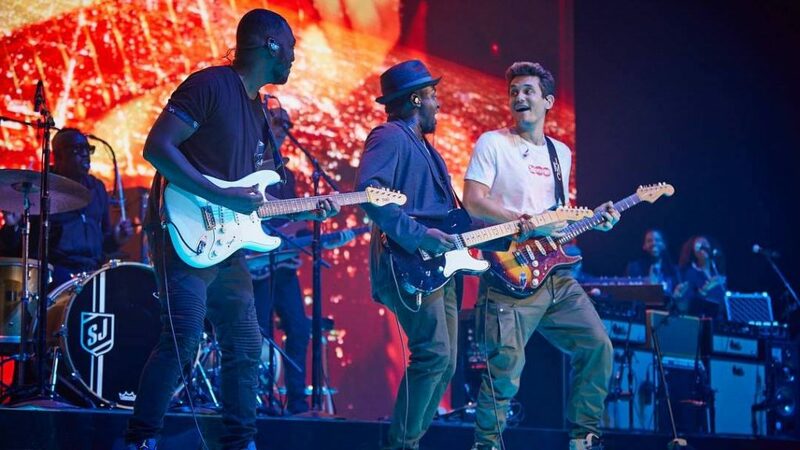 As fate would have it, the CD wound up in the hands of a 19-year-old John Mayer enrolled at Berklee College. And when Mayer moved to Atlanta in 1998 to start his own singer-songwriter career, Harris was one of the first musicians he looked up. The two have been playing music together ever since. Harris continued working on solo music over the years, releasing Soulstice in 2003 and The Bittersweet in 2006. But Mayer’s extended touring runs took up the majority of time. In recent years, though, Harris has concentrated on maintaining a consistent solo output again. He released his first full-length in nearly a decade and this summer put out Songs for Other People in between legs of the Search for Everything Tour. He’ll be taking his latest on the road this fall and is already making plans for a busy 2018. Below, Behind the Setlist caught up with Harris to chat about touring with John Mayer, the ups and downs of his unique career arc, new solo music, and the advantages of never feeling too cornered. This interview has been edited for length and clarity. This is the last week on this leg of the Search for Everything Tour. I’ve seen it three times and was a huge fan. What’s it been like on the road for this one? It’s been a lot of fun. I’ve had a lot of people say we look like we’re having a blast up there. I tell them it’s not an act. Everybody’s having a great time. Personality wise and music wise, everybody is having the freedom, and now we’re on autopilot. The first month you’re kind of feeling everybody out. Now we’re just having fun with it. I’ve seen John on about every tour he’s done since Continuum and I think this is my favorite lineup. You’ve got Steve Jordan and Pino Palladino, and then the new guy, Isaiah Sharkey, on the guitar with you as well. Where does this stack up for you in the lineups you’ve been a part of? They’re all different. It’s great to be able to play with Steve and Pino. Obviously, those guys played on records and both are legends. So I was really looking forward to getting on the road and playing with them. It’s a great combination of energies. Isaiah is not even 30 yet and a great, great guitar player with huge, open ears. That’s been great to be around. I love everybody’s sense of humor and everybody’s approach to music. John is really open to letting people interpret parts, which is probably due to some of the looseness in the Dead & Company stuff. We don’t have to adhere as closely to recorded versions or whatever. Everybody has the space to do their thing. How did you originally meet and hook up with John, because you’ve been touring with him off and on for quite a while now, right? Yeah, we were friends back in Atlanta before he had a deal. I put out a record on Columbia in the late ‘90s. I guess he and a couple friends had listened to that record a bunch when they were at Berklee. So when he moved to Atlanta, he was like, “I got to meet that guy. I got to find that guy.” We had a mutual friend, who introduced us. We played open mic nights and all that sort of stuff you do as a singer-songwriter in Atlanta. We did a lot of those together. How many tours of his have you done at this point? Oh man, I don’t know. I came in on the end of Room for Squares, and then I’ve done all of them except for the one he did for Born and Raised. You mentioned the openness feel of Dead & Company on this tour. Have you noticed a big shift musically since he started doing that? His playing is a lot more open and at times not as blues-based as it once was. He’s just going to have more of a vocabulary now. I think that would be the case with anybody, having not played with him for a few years and then coming back. You’re big moment on each show is performing “The Beautiful Ones” by Prince as an intro into “Slow Dancing in a Burning Room.” How did that idea come about? I used to do another song into “Slow Dancing.” So it was like, “Hey, do you want to put something before?” That one worked out because the key of that one matches the intro of “Slow Dancing.” It’s open, I could put whatever I wanted to in that spot, but that always seems to work. I think I put “Comfortable” in that spot once, and that was cool too. Has there been a favorite song you’ve really liked performing on this run? Nothing in particular, really. I love playing “Helpless.” “Moving On and Getting Over” is fun because we do the co-lead vocal thing. I don’t really have a favorite. They all have a thing. I’ve done tours in the past where you look at the setlist and are like, “Aw man, I don’t want to play that.” But no matter what comes up on this setlist, we’re like, “Great! This is awesome. This is going to be a good set.” Which is a testament to the songs aging well and a testament to everybody having space to express themselves within the songs. On this tour the set changes every night, and even interpretations of songs can be different night-to-night. That’s a lot different than most artists, where it’s not as free flowing. How do you compare the two? To be honest, I don’t really tour with other people. This is the only way I know how to do it. You go see other shows, but you may only see that show once. You don’t know how different that is from the night before. In terms of other tours I’ve done with John, this has been great because every night is a new thing. It keeps it fun and there’s been a lot less fatigue, in terms of being ready for a tour to be over or whatever. John has such an extensive catalogue out now that it’s got to be a challenge to fit into 20 or so songs, especially with the acoustic and Trio sets. Do you wish you were playing longer? There are definitely nights where we’re playing and it’s like, “Aw man, we’re just getting started and now we have to stop.” It’s been a while since we’ve added a new thing in the setlist, but I think now we’re up to 35 songs or so. I would love to play for longer. I think everybody would like a longer Trio set, or maybe a little longer acoustic set. In terms of the band, the momentum gets a little broken up, because we do the full band thing, take a break and come back later. I think we could play another hour and we wouldn’t be tired. When we’re having fun and the crowd’s having fun, there’s an energy you just feed off of. But a lot of times, before you know it, it’s over. Are there any plans to record one of these shows? Let’s talk about this new record you put out in June, Songs for Other People. I understand, as from the title, it’s based on fictional musical short stories. What was it like writing from that perspective? I didn’t really set out to write a record. This is more a collection of songs I had that were all going to be pitched to other people. They never got cut. They never found a home. I wanted to put them all together. They aren’t necessarily my stories, and they weren’t actually songs necessarily for me. That’s the double meaning behind Songs for Other People. Musically, you have a wide range of styles you’ve played with over your career. This record and Lightyears, from a couple years ago, seem to be a little more in tandem with pop and adult contemporary, with a little bit of soul in there. What’s it like at this stage in your career to work in those genres? I feel genreless in terms of my overall thing. I do whatever I feel at the moment. I probably should be more mindful of where this music is supposed to go or live in terms of categorization, but I just do my thing. That’s been a logical progression. I never said, “Hey, I need to start making more pop stuff or more adult sounds.” I do what I do and let other folks figure that part out. I’m interested in the song “Coldplay,” which is about tracing how a band’s music fits into a relationship. How did that idea come to you? I wanted to make a story where the chorus could stay relatively static but the verses could progress. Coldplay is one of the few bands that has a thing. You could say you’re having a Coldplay moment and somebody knows what that is. There aren’t very many bands around right now where it’s almost like a lifestyle brand. We all go back to relationships or places we were when we hear music or certain bands. You fall in and out of love with a band, and that band and their music marks a period of time for you. I thought it was a great companion to the arc of a relationship. And is it true you have never been to a Coldplay show? One other song I was curious about is “Fascinating,” which opens up the record. Can you talk about that one? That one the chorus came to me first. I knew what I wanted the verses to be about, but it took a long time to figure out the off-the-beaten-path things that a woman might do that are also complimentary. You don’t want to say stuff like, “I can tell when you’re really laughing because you get wrinkles by your eyes.” That’s not very complimentary. I wanted to paint a picture of a woman doing her daily ritual and you’re letting her know all those little things you think I’m not paying attention to, I’m paying attention to. I don’t think there’s anything about love in the song, but in that attention to detail, you can tell this man loves this woman. Between this and Lightyears, you’ve been able to have time recently to focus on putting more solo stuff out and doing your own tours. Has that been cool to get back into the swing of and do on the side? Absolutely. In most ways, the playing with John is the thing on the side and my career as a solo artist is my number one thing. And then that got derailed because I’ve been doing so much touring with John. It’s been great to get back to doing my thing. I love playing shows. I wish I could afford to travel with the band I like to travel with, but it’s great doing this solo acoustic or solo electric stuff. It’s great all-around to go out and flex that muscle and get up close to people. That’s where I feel most at home. When you were first starting out, did you come up in bands or was it more solo? One hundred percent bands. I didn’t start on acoustic guitar and I didn’t have one until I had been playing for quite a while. My band had a record deal, toured and done the whole thing before I even bought an acoustic. Do you think that’s given you an outside-the-box thinking when it comes to writing music now? Having not come from a solo perspective? Nah, not anymore. Even when I was in a band, I loved the idea of writing for solo stuff. Prince wrote everything and played everything. Stevie Wonder wrote and played and did everything. I was familiar with the ethos of it, I just didn’t do it. Your general career arc is so fascinating, starting out in the ‘80s playing in a metal band and then working a lot in the ‘90s with Brendan O’Brien, who’s one of the most legendary rock producers of all time. What’s it been like to, as you were saying, be genreless and have your foot in all these different doors? It’s all I’ve ever known. I don’t know any other way, really. Sometimes you live and die by that ethos. I’ve definitely been told at times in my career when I was signed at majors that I was too eclectic. My records didn’t seem cohesive. There’s too many different styles on the record. People were having a hard time pinning it down, but it’s the only way I know how to do it. I’ve always gone by the ethos that the average music listener doesn’t have only one type of music in their collection. I want my records to reflect the things that I like, to reflect all the different emotions and different styles I have in my collection. Yeah, with the playlist culture today that’s probably easier now than it was back in the ‘90s. You had to stay in your one lane, and it was weird if you deviated out of that. Brendan O’Brien signed you and produced your first band record and solo record back then. What do you remember about working with him? A couple things. From a personality standpoint, he always puts his family first. That always made a really big impression on me, that he made sure to spend time with his family and went home for dinner. Musically and in terms of capturing the music, I always try to remember the idea of capturing moments that aren’t necessarily perfect. It’s not about making sure you have the perfect amp for this particular part, it’s about capturing the emotions. A lot of times people go past the emotional part to get the perfect thing and they miss the performance. Performances are more important than being perfect. You have a solo tour coming up in September and then some shows down in South America with John in October. What else do you have planned for the rest of the year? Once I get done with those shows, I’m doing some solo shows on the West Coast. Then before Thanksgiving, I may try to go to Nashville for a week or 10 days to do a writing trip. Post Thanksgiving, I don’t plan on doing much that the public knows about. I’ll be able to hang out with my family, because I missed a lot of stuff while on the road. My little one just started walking. I want to hang out and be there. Is there anything you’re kicking around for next year already? I’ll definitely start on a record and hopefully try to finish by April, but I’m not really sure what it will be. I’m thinking about doing a proper band with a few guys, and that will probably musically be a little heavier. I kind of miss that. I’ll see how I feel at the top of the year. Between being on the road with John or doing sessions for other people, what’s it been like to balance that with your solo career or the past projects that weren’t able to last as long? Do you wish you had something more stable, like a fulltime band thing, or is it cool that one month you can be doing one thing and the next month you can be doing something completely different? I definitely love the freedom of being able to bounce around and do different things, but my favorite thing of all is the band dynamic. I would love to be in a band with four other dudes and create from that perspective. It just hasn’t worked out that way. It’s hard to put together a band in L.A. The guys I would want to play with, everybody’s got so much different stuff going on. You can’t afford to devote 100 percent of your time to a baby band, hopping in a van and doing that whole thing, just because we’re a little bit older. When I go out and do stuff where I feel like I’m really loud, I’ll do that for a while and then I’ll feel like I just want to be by myself. So I’ll play by myself for a while, and then I’ll miss being with other people. I’m incredibly fortunate that I don’t ever feel cornered and that I don’t have to do a certain thing. Hopefully that will always be the case.